Does your team have enough time in the day? Is productivity difficult to define? Download this ebook to learn how to be more efficient as a team. 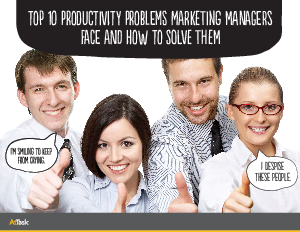 In today’s fast-paced marketing environment, you are constantly being asked to increase productivity, report on what you’re working on, when it’ll be done and what’s next. At the same time there are frequent interruptions and new work requests while you’re juggling multiple tasks for multiple campaigns in various stages of completion. Sound familiar?